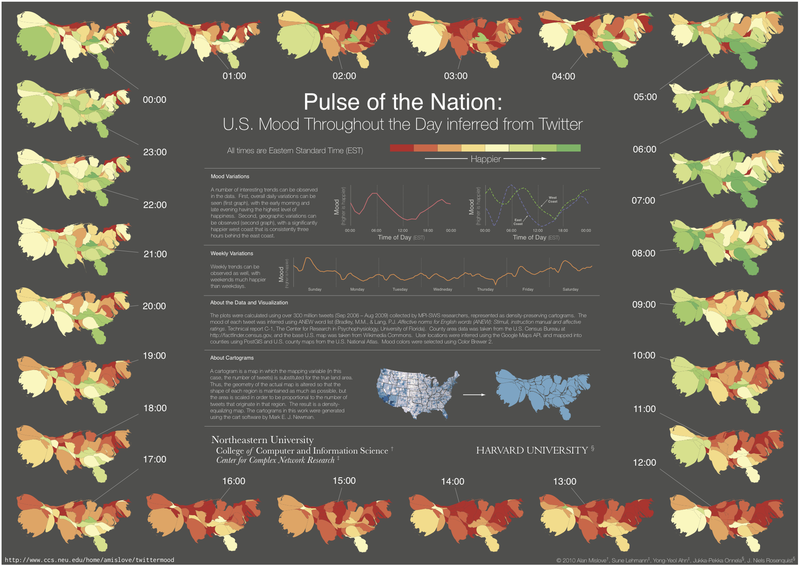 Here is an interesting video depicting how the mood for US tweeps changes across the span of a work day. The map is morphed to depict the number of tweeps from each state rather than the area in what is called a cartogram. It might that surprising that most people are at their lowest during their midday or midweek or that the west coast is the happiest place in the US while the midwest is the most sour. What is really surprising is that Michigan is always pissed off! Cheer up Wolverines! I think it's a nice try however, emotions are too complicated for someone to assume to be able to measure them on such a scale.